The Institute of Advanced Motorists (IAM) has issued some helpful advice to travellers this summer, urging them to stay cool and calm behind the wheel, even when the temperature soars. Drivers might feel the urge to put their foot down when taking to the roads in this hot and balmy weather, but this is a practice that can be extremely risky. Indeed, it is important for all road users to realise that roads have speed limits for a reason and that the signposts they pass should be viewed as a maximum velocity, not a target. Failure to do so can impact not only a driver's own personal safety, but the safety of all those around them as well. As such, the IAM recommends all motorists make themselves aware of the tell-tale signs of what makes a certain road a specific speed limit. One of the first things drivers should look out for is street lighting, as in areas where there are overhead lights, this is often a giveaway sign that the road will be a 30 mph zone, at most. 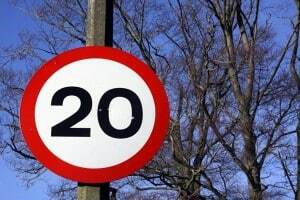 However, with many 20 mph zones now being implemented across the country, travellers must always keep their eyes peeled for road signs whenever driving. Meanwhile, motorway users should be on the lookout for overhead gantries and roadside signage that denotes the speed limit of the stretch of carriageway they are travelling on, as variable speed limits are now in effect on many parts of the motorways network. Peter Rodger, the IAM's head of driving standards, said: "Drivers should recognise that limits are there for a reason – which are sometimes not easy to see. "Speeding traffic is a frequent complaint of residents across the country. Make driving without breaking the limit something you do easily – and avoid the fines."